We hope everyone had a wonderful Easter yesterday and enjoyed time with family, friends, and loved ones! My parents were here in Arizona earlier in the week and my brother and his family came to visit us for the weekend. They left yesterday afternoon, after a weekend full of fun memories with our children, beautiful weather, time in the pool, food on the barbeque, lots of yummy appetizers and drinks, and an Easter egg hunt! We had so much fun and I am glad they came to spend the weekend with us! 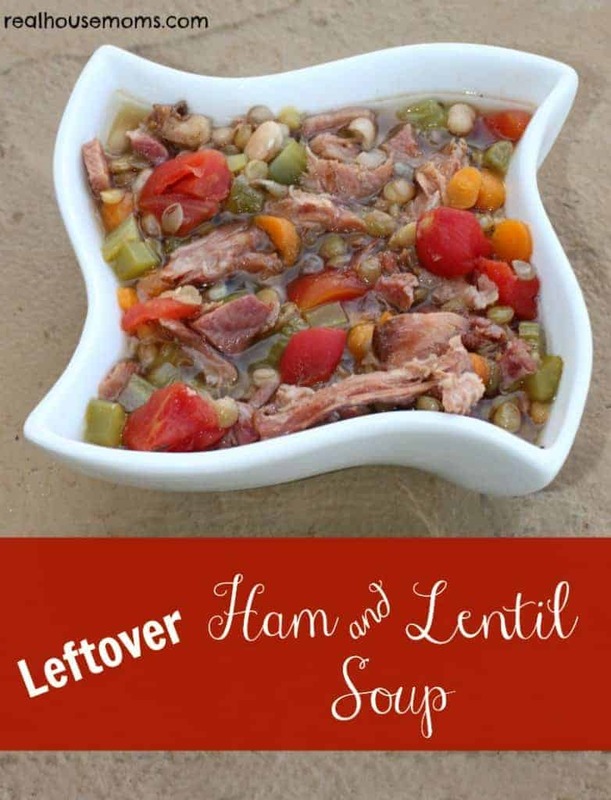 We had some leftovers from our Riesling-Peach Glazed Ham, so we made a delicious Ham and Lentil Soup! It was a perfect healthy way to use some of the extra meat and all of the different ingredients made it hearty and super tasty. The nights are still a little chilly here in Arizona, so soup makes a nice dinner. Leftover Ham and Lentil Soup includes super yummy leftovers from the Riesling-Peach Glazed Ham and makes a hearty, healthy, and tasty dinner! Thank you for such a yummy soup !! It is a very healthy soup or a meal by itself !! I don’t like instant or canned food, so I will boil the white bean with the bone. I eaten lentils dish in Paris but I don’t know it is lentil as it was written in French as the lentil that I used to cook is without skin which the Indians used to cook it in curry !! Oh may be it is your dish as it didn’t have tomato, white beans & celery in it !! A secret to make beans cook faster is to soak them after dinner then freeze the whole box with water before you sleep. The next day you can drop it into more water to cook !! It will tender within 1/2 hr. Some smaller beans ( red beans, green beans and so on ) will be tender within 15 mins !! Check the tenderness yourself if it is your first time using this method !! We used our ham bone to make a ham and corn chowder after Easter. But your soup looks yummy! Love the use of lentils and white beans, a creative combination.